Fancy learning the saw? Then you’ve come to the right page – just get yourself a saw, a bow and some rosin and read this short tutorial. I have been playing the saw for thirty years – as a teenager I was taught to play by folk musician Bunny Nun in Watford, UK. I’ve since taught many others to play the saw, including the members of the mighty sawchestra in The Lost and Found Orchestra (Yes/No productions). I still occasionally feature the saw, alongside theremin, in my live act. A track from my old band Spacedog – I’m on saw and Stephen Hiscock is on vibraphone. Early test with Hugo the vent doll, before his head was roboticised, featuring a short saw solo. The sound of the saw is so unexpectedly beautiful, some listeners find it hard to believe where it’s coming from. Played well, the saw really does sing. Its brilliant, ethereal sound is rather like the sound of a human voice. Saw players stroke the edge of the saw with a cello or bass bow (sometimes home-made) to make it vibrate. Occasionally they percuss it with a soft beater. They bend the instrument to swoop from one pitch to another, giving the instrument its characteristic portamento sound. 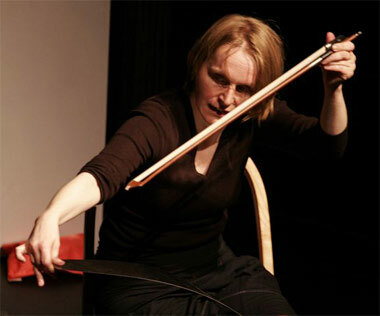 The musical saw is a wonderful ‘skiffle instrument’ – a cheap, everyday object that has been appropriated by musicians who have no money to buy classical instruments. I’ve encountered players of this traditional European instrument in Britain, Holland and the USA. You can see some examples of my saw playing in the video on this page. An example of saw playing that’s easy to come by is in the film ‘Delicatessen’. One of the central characters plays the saw beautifully on his roof. Occasionally, I’ve heard what I think is percussive saw playing on recordings by the chanteuse Edith Piaf. I’ve heard that saw playing is still quite common in Holland, for instance in bars in Amsterdam. My grandfather Emlyn was a saw player – sadly he died many years before I was born. In 2015 I performed at the International Saw Festival in Brooklyn and was delighted to meet saw players from around the world. These notes have been online since the mid-1990s and much copied and circulated – feel free to circulate them further but do please credit this source. I’ll add a tutorial video when I get a little time.